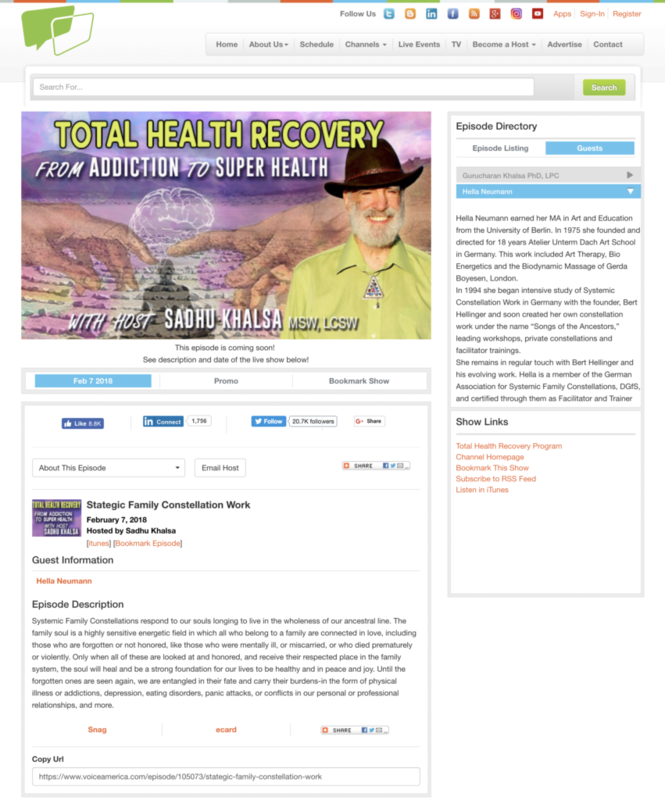 I am thrilled to announce that I will be talking to Sadhu Khalsa on Wednesday, February 7th, 2018 about Systemic Family Constellation Work for his Total Health Recovery Show on Voice America. You can join us live at 2pm MST. Systemic Family Constellations respond to our souls longing to live in the wholeness of our ancestral line. The family soul is a highly sensitive energetic field in which all who belong to a family are connected in love, including those who are forgotten or not honored, like those who were mentally ill, or miscarried, or who died prematurely or violently. Only when all of these are looked at and honored, and receive their respected place in the family system, the soul will heal and be a strong foundation for our lives to be healthy and in peace and joy. Until the forgotten ones are seen again, we are entangled in their fate and carry their burdens-in the form of physical illness or addictions, depression, eating disorders, panic attacks, or conflicts in our personal or professional relationships, and more. You can also find Sadhu’s podcast on iTunes.